What comes to mind when you hear the word malnutrition? Most people immediately think of heartbreakingly thin, hungry children in developing countries—something straight out of a Save The Children commercial from the ’90s. In actuality, people of all ages, from all over the world, suffer from malnutrition. But it may surprise you to know that seniors are particularly at risk. It may also surprise you to know that their increased risk isn’t exclusively linked to hunger or lack of access to healthy food. Chronic diseases like cancer, Alzheimer’s disease, diabetes, and other conditions that can diminish appetite can also lead to malnutrition. In addition, more frequent hospitalization also puts the older demographic at a higher risk. The National Center for Biotechnology Information (NCBI) cites that as many as 50% of hospital patients worldwide suffer from malnutrition. And the Alliance for Aging Research cites that as many as 65% of hospitalized older adults could face malnutrition. Seniors living in long-term care facilities are also at increased risk due to the fact that they’re more likely to have multiple chronic conditions, and they often feel isolated (resulting in a loss of appetite), and may be dependent on facility staff for help eating. Let’s take a step back for a minute and talk about what constitutes malnutrition and why it’s important to identify as soon as possible. Malnutrition, also referred to as malnourishment, is a lack of proper nutrition. In essence, it’s a condition that occurs when the body isn’t receiving adequate quantities of nutrients. So what are some signs and symptoms that can help you pinpoint malnutrition in a client or someone you know? Don’t rely on physical appearance alone. People of all sizes, body types, and weights can suffer from malnourishment. 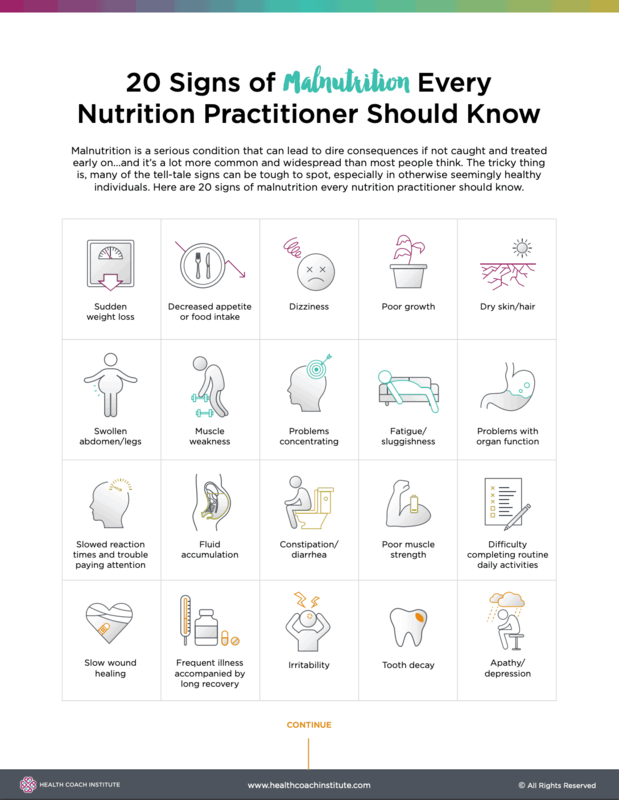 To learn more about the signs to look out for and how you can help someone suffering from malnourishment, click below to download 20 Signs of Malnutrition Every Nutrition Practitioner Should Know now. How is Undernutrition Different From Malnutrition? People sometimes confuse malnutrition with undernutrition; but they are, in fact, different. Undernutrition and overnutrition are different forms of malnutrition. Someone with undernutrition isn’t consuming or absorbing nutrients adequately. Someone with overnutrition is characterized as having excess absorption or consumption of nutrients. According to NCBI, undernutrition affects 900 million people worldwide, and can have serious consequences on a person’s health, similar to malnutrition. Most often, undernutrition is caused by poverty and illness (like diarrhea and other conditions linked to insufficient food consumption). Is Precision Nutrition The Answer To Malnutrition? In today’s world, where there is an increased reliance on genetics to provide valuable insight into how we can improve health, scientists can now examine how an individual’s genes may affect how they metabolize nutrients. According to an article published by Harvard Health Publishing, this has opened the door for a new approach to nutrition called “precision nutrition”, where individualized eating plans can be customized to a person’s genome. But is it the answer? Not according to the Academy of Nutrition and Dietetics. Because there’s no research to prove their effectiveness, they recommend against relying on genetic websites that sell customized diets. Sometimes the simplest, most straightforward action is the best action, and this seems to be one of those cases. The best way to achieve healthy nutrition (sometimes referred to as eutrophy) is by consuming the right foods in the right quantities. Because understanding that delicate combination isn’t always easy, more and more people are turning to holistic nutrition practitioners for guidance and support in this area. Are you passionate about nutrition and helping others, and wondering how you can turn that passion into a career that transforms lives? Watch our free webinar to find out how you can launch a rewarding career as a Nutrition & Health Coach in as little as six months.